Tech Wrap-Up 4-15-2019. Today is Tax Day in the United States, the deadline for filing individual income tax returns to the federal government. Tech Help Knowledgebase wraps up each day with a summary of today’s most engaging stories from our social media feeds. We order the story summaries below by user engagement (posts with the most likes, shares, clicks, hashtag clicks and detail expands) and by the number of impressions they received. Stories are in descending order with the most engaging story at the top. Our human-curated social media feeds include links to technology news, how-to and help articles, and video tutorials for common issues. Stories curated for our feeds are from our staff writers or culled from third-party sources that produce content related to the categories covered by our site. See the summaries and links below for today’s top stories by user engagement. Follow us on Twitter, Facebook, Instagram, and YouTube to interact with our feeds. Apple’s Worldwide Developers Conference begins on June 3, 2019, in San Jose, California. Apple is widely expected to reveal the next iteration of its mobile operating system, iOS 13, during the conference. 9 to 5 Mac provides exclusive details about what Apple may include in the new iOS version. Some of the new features and changes chronicled are dark mode, multitasking, undo gesture, Safari improvements, font management, a smarter Mail app, and other changes. Last minute tax filers may need a fast and easy way to share forms and information worthy of encryption. In keeping committed to security and privacy principles outlined in its manifesto, Mozilla introduced Firefox Send. Firefox Send enables users to share files with end-to-end encryption without needing to register. Ashish Thusoo is the co-founder and CEO of Qubole and co-creator of Apache Hive. Drawing from his own experience, he writes for Venture Beat that open source ecosystems require incentives to be successful. Cloud providers may realize unfair benefits from open source projects if they use them without giving back to the community. Thusoo suggests that licensing, a code of ethics, and competition work toward improving the situation. News of the Chromification of Microsoft’s Edge browser provides a certain excitement level to Windows 10 and web browser enthusiasts. Last week, Microsoft released a Dev Channel and a Canary Channel version of the new Edge browser for testing and tinkering purposes. The new Edge will join other Chromium-based browsers — exceptions being Safari and Firefox — to make up 85% of browser user share. Eric Plam, President of the mobile Wi-Fi company, Skyroam International, offers some suggestions on how to take the necessary precautions, or “hackticts,” to protect yourself from most online vulnerabilities. Plam covers public Wi-Fi, running regular tests on your systems, managing third-party permissions, data encryption, and more. Windows 10 users know that the current version of Edge browser is an adept PDF tool. Some of Edge’s PDF functionality is unique to Edge. The new Chromium-based Edge browser is still a pre-release work in progress. Given that, some PDF features appear to be missing but are just hidden. Time will tell how Microsoft decides to layout the PDF tools in the new Edge version. 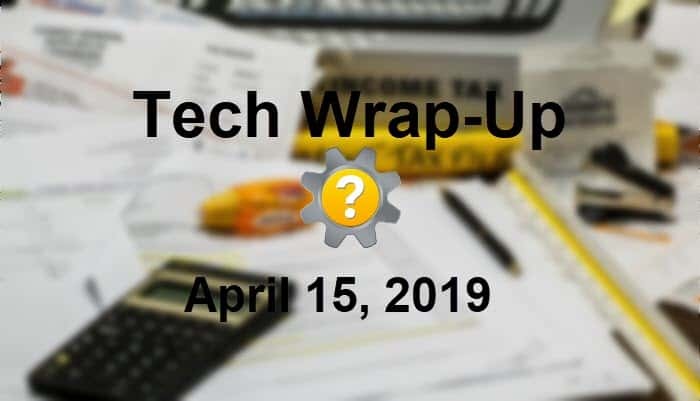 Thank you for visiting Tech Help Knowledgebase to read the Tech Wrap-Up 4-15-2019. If you liked this article, follow us on Twitter @techhelpkb and subscribe to our YouTube channel to keep in the loop.